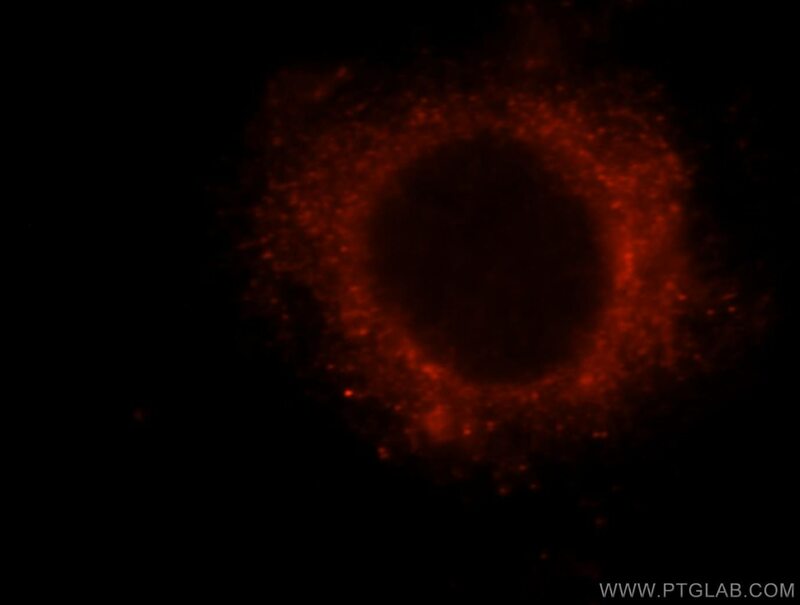 Immunofluorescent analysis of Hela cells, using RB1CC1 antibody 10043-2-AP at 1:25 dilution and Rhodamine-labeled goat anti-rabbit IgG (red). RB1CC1, also named as RBICC, is implicated in the regulation of RB1 expression and functions as a DNA-binding transcription factor. It is a potent regulator of the RB1 pathway and a mediator that plays a crucial role in muscular differentiation[PMID:15968549 ]. 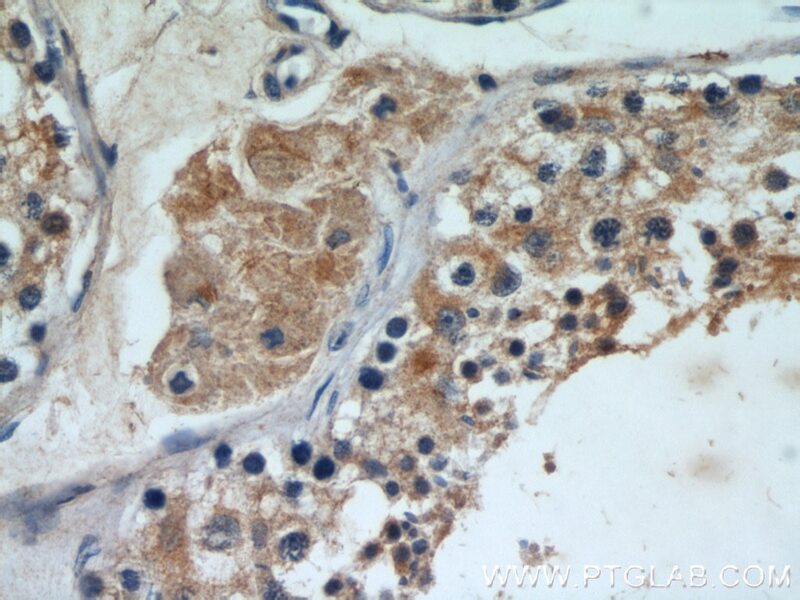 Its expression is, thus, a prerequisite for myogenic differentiation. Involved in autophagy. RB1CC1 is required for autophagosome formation [PMID: 19258318]. 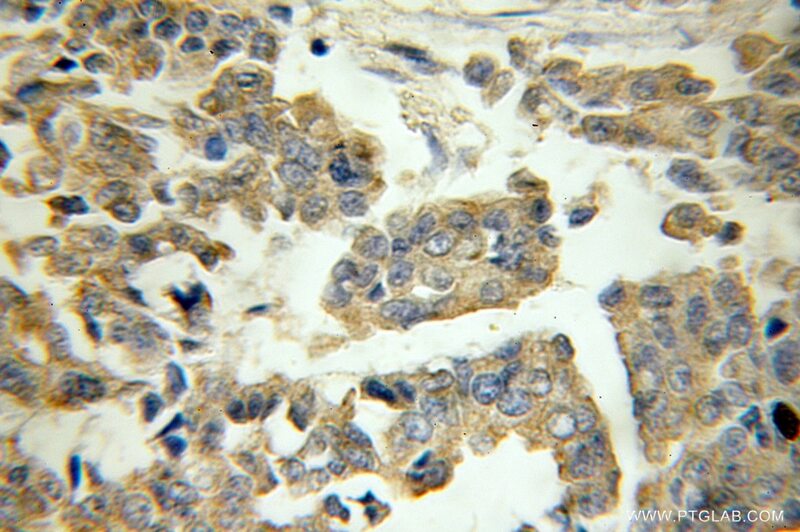 It is probably involved in the tumorigenesis of breast cancer[PMID: 14533007]. 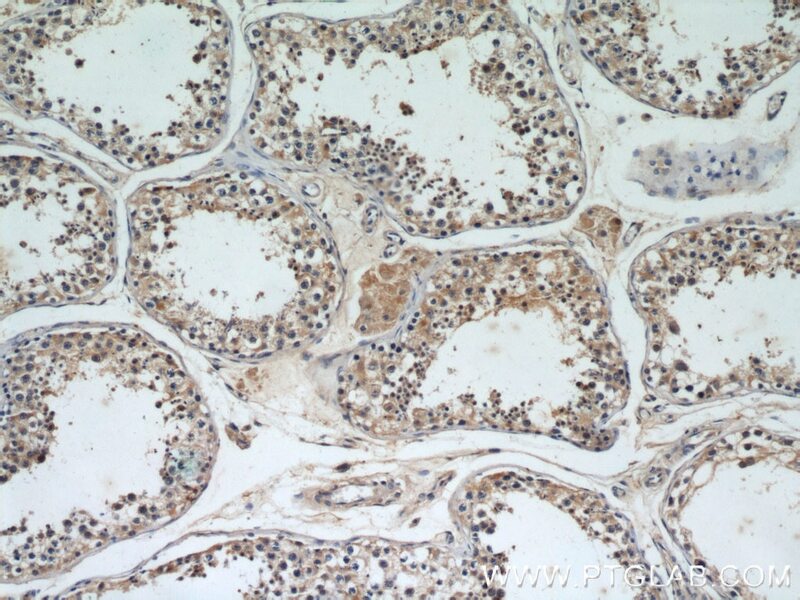 RB1CC1 is frequently mutated in breast cancer and shows characteristics of a classical tumor suppressor gene[PMID: 21602932]. 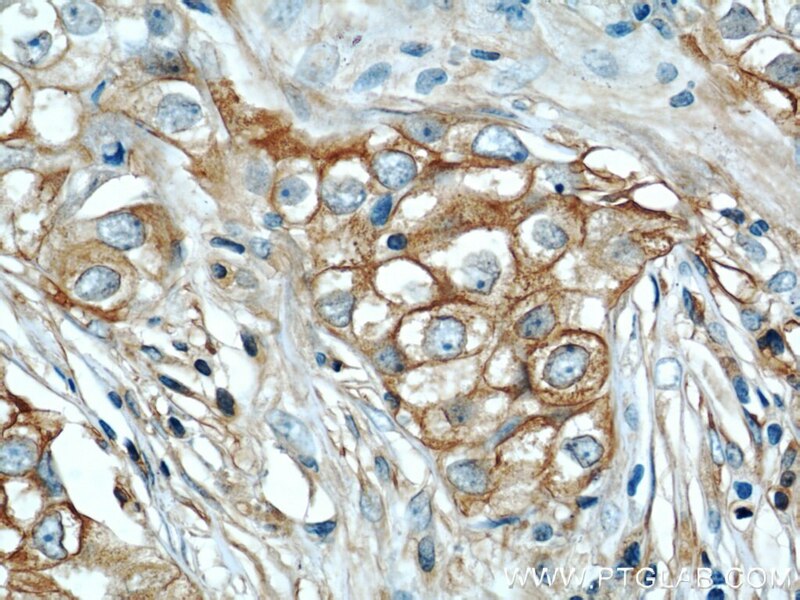 The immunogen of this antibody is C-terminal 154aa of RB1CC1. ULK1.ATG13.FIP200 complex mediates mTOR signaling and is essential for autophagy. Downregulation of FIP200 induces apoptosis of glioblastoma cells and microvascular endothelial cells by enhancing Pyk2 activity. Noncanonical autophagy promotes the visual cycle. 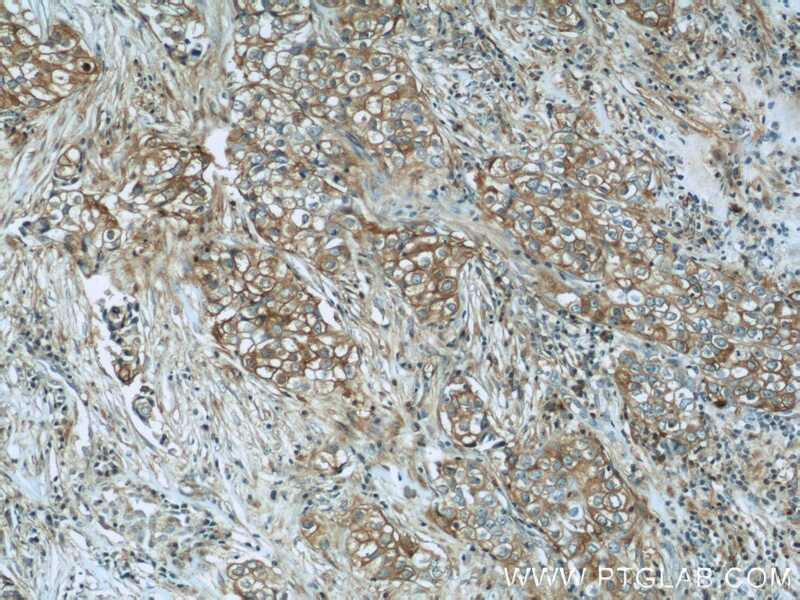 Identification of miR-133b and RB1CC1 as independent predictors for biochemical recurrence and potential therapeutic targets for prostate cancer. Autophagy inhibition re-sensitizes pulse stimulation-selected paclitaxel-resistant triple negative breast cancer cells to chemotherapy-induced apoptosis. Phosphatidylinositol 3-kinase and COPII generate LC3 lipidation vesicles from the ER-Golgi intermediate compartment.